Ask us your Sea-Doo related questions and we will choose three to be answered by a Sea-Doo expert on camera. The subject matter can be anything, best ride locations, safety practices, design related, technical, where to race, best model for my dog, anything! We will post the answers video right here on OnBoard on Thursday, September 1. Kevin Wassum was recently crowned the Ultimate Sea-Doo Fan. kevin was one of over 850 enthusiasts that shared their passion for Sea-Doo in the contest launched in the Spring and concluding at CLUB BRP in Montreal in July. Kevin proved his passion and ability to share his experiences and is now continuing his Sea-Doo riding adventures with his friends and wife Corrie and will be sharing those experiences with the Sea-Doo World. Lets get to know him a little better. 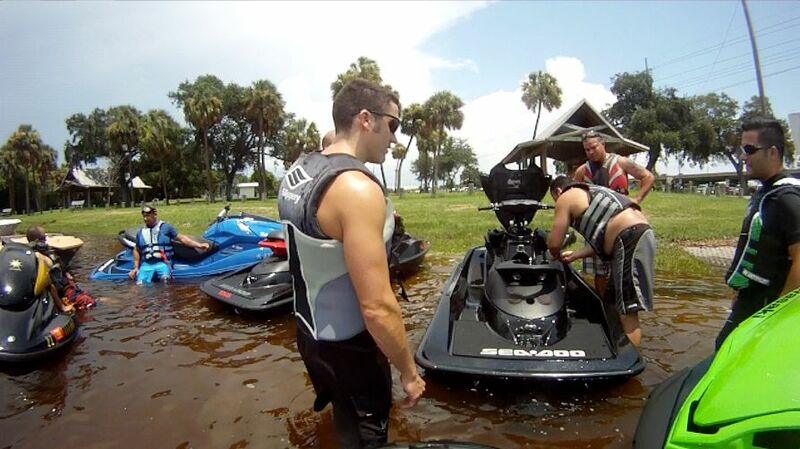 The Ultimate Sea-Doo Fan, Kevin Wassum, preparing to ride with the Tamp Bay Sea-Doo Crew. Kevin, where did you grow up and where does your passion for watersports come from? I grew up in Sylvania Ohio, just below the Michigan border. Despite our close proximity to Lake Erie I never really had any exposure to water sports in Ohio. My love for the water comes from the family trips that I went on as a kid to my grandparents’ house in Connecticut. They lived on Quiambog Cove off Fishers Island Sound so I was able to go boating on the ocean at a very young age. I work in downtown Tampa as a software engineer for a company specializing in healthcare software products. Basically, I write computer code to facilitate the storage and transmission of healthcare data on various touch-screen medical devices and servers. The devices and software that I work on are implemented by hospitals and medical centers all over the world. Computer programming probably isn’t what most would consider an “exciting” profession, but it definitely helps provide a bit of balance in my life between intellectual and adventurous activities. 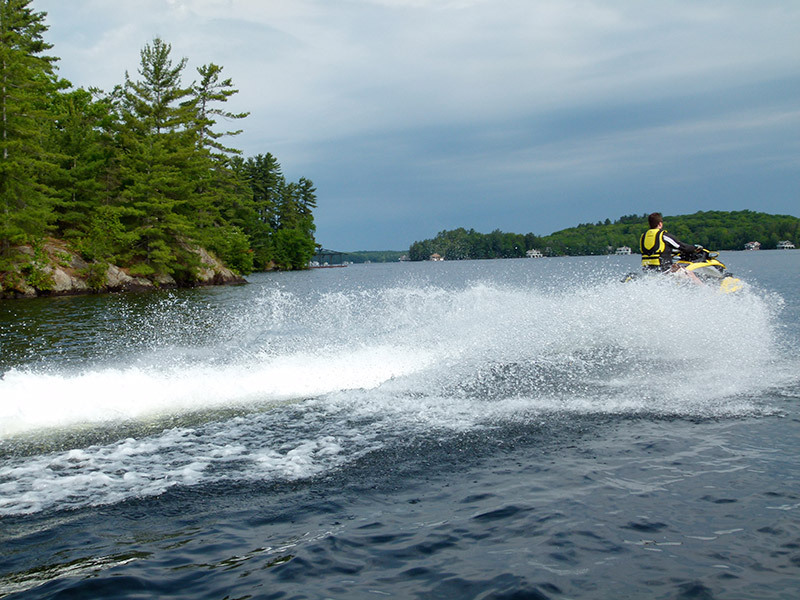 How were you introduced to Sea-Doo? In August of 2006 my best friend moved to Florida to accept a teaching position in St. Petersburg. My wife, Corrie, and I flew down from Ohio to visit him that same month. I had always wanted to ride a Sea-Doo but never had an opportunity before that trip. So, one of the first things we did when we arrived for vacation was to rent a couple of Sea-Doo GTIs. That ride on the GTIs was my first experience with personal watercraft and I was instantly hooked. From that day forward all I ever talked about was moving down to Florida and buying a Sea-Doo to ride year-round. It took a year and a half of hard work to make that dream come true, but it was absolutely worth it! Kevin, since then what are some of the adventurous rides you have done? I’ve been lucky enough to ride all over the state of Florida, from alligator patrolled rivers and lakes to the state’s beautiful surrounding ocean waters. But my most adventurous rides, and what most of the local riders know me for, are the rides I’ve done to the Bahamas. After doing a practice ride from Miami to Bimini in 2010, we set our sights on the dream of making it all the way to the Exuma Islands. It took us six months of constant planning and gathering of supplies, but we did it. This past June I left Miami riding on a 2008 RXT 215 along with a Sea-Doo 180 Challenger SE carrying my wife and two close friends, Jeff Lackey and Ashley Sponaugle. We rode from Miami to Bimini and then to Chub Cay on day one. The following day we rode through Nassau and then down to Norman’s Cay in the Exumas. In all, we were in Bahamian waters for nine consecutive days and made it as far as Staniel Cay before turning back. The trip was not without some tense moments and we definitely had to earn every mile we traveled, but it was one of the most memorable experiences of my life; both very exciting and humbling at the same time. Up until this past July my favorite boating event was probably the 2010 WaterTop/Barney’s Poker Run in St Petersburg, Florida. That was really the first group ride that my wife and I were able to do. The ride itself was a lot of fun and it had stops at several scenic areas around Tampa Bay and the Gulf of Mexico. We also ended up meeting a lot of great friends there and have continued riding with them ever since. More recently, I’d have to say my favorite “boating” related event was the CLUB BRP convention in Montreal. Having never been to an event like that before, I really didn’t know what to expect but I was really blown away by the whole experience. It was definitely “VIP” from start to finish. To be able to see the BRP Design & Innovation Center was incredible. It was also very cool to be able to walk through the manufacturing plant and see the same assembly line that my RXT was born on just a few years earlier. But the best part was being one of the first to see the unveiling of the new RXP-X 260 and then having access to try all of the different models Sea-Doo makes. It’s basically the equivalent of a kid being given access to everything in a toy store. What is it about PWC riding that keeps you coming back? I’ve been riding almost every weekend in Florida for three years now and I still get an adrenaline rush just from driving to the water with my RXT on the trailer. For me, riding a PWC is the only time when I can completely clear my head of all the stress and complications that exist in day-to-day life. As soon as I squeeze that throttle lever, it’s all about the moment and enjoying the ride; everything else drifts out of mind. One of the greatest aspects about PWC riding is that it’s always different. The water itself and everything in it are always in motion and changing. You’ll never have an identical formation of waves or currents from one ride to the next. Aside from that, there are just so many different ways to ride. 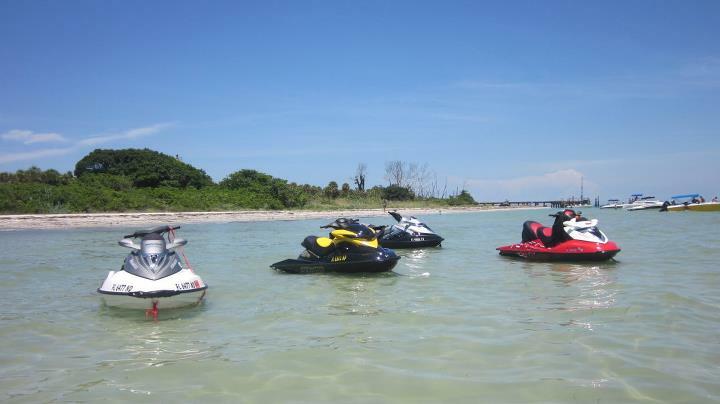 The Sea-Doo models available today are really very versatile. Sometimes we go out and ride WOT until our tanks are empty. Other days we take family members out sightseeing on slow, casual rides. Some rides are short range and others last for several hundred miles. With so many different ways to ride, it’s impossible to ever get tired of going out on a PWC. Kevin, where is your favorite riding location and what is your dream ride? My favorite local riding location will always be Egmont Key. It’s a small island that sits at the mouth of Tampa Bay and has a lot of great scenery and history. The route we take when riding to the island has a little bit of everything, flat water for speed runs, ocean chop for wave jumping, tons of wildlife, and water depths ranging from four to eighty feet. In the early spring each year the water clarity is at its best and it’s easy to feel like you’re riding in the Caribbean. Right now my dream ride would be a fourteen day adventure from Miami through the Exumas and then all the way down to Turks & Caicos. Long distance adventures across the ocean on Sea-Doos are pretty addictive. Once you experience the excitement of riding in foreign waters, it’s difficult not to want to keep pushing the limit and go further each year. There’s definitely nothing quite like racing a Sea-Doo around foreign islands in turquoise blue water. To be able to travel that far and be so close to the water the entire way is just an incredible feeling. I think you lose that connection with the water when you travel in a large boat. Besides, I see the passengers on the large boats when we pass, and there’s no way they’re having as much fun as I am. What are you riding right now and what are looking forward to? My current watercraft is a 2008 RXT 215 nicknamed “The Red Dragon.” Typically I ride it whenever I go out locally, and I use my wife’s black RXT 215 for long distance rides. We’ve got a combined 381 hours between the two of them. I’m pretty obsessive compulsive about cleaning and maintaining them so I have no doubt they’ll see another 381 hours of operation. Obviously right now I’m really looking forward to getting the new 2012 RPX-X 260. I was extremely impressed by it in Montreal and I can’t wait to race it around the Gulf down here in Florida. The fact that the engineers were able to increase the RXP-X’s hull length, cornering capability, and playfulness all at the same time is just amazing. It feels like you’ve got the maneuverability of a smaller watercraft and yet it also seems much more capable in rough water conditions. I like the approach Sea-Doo took this year when they focused on building the total package; it has great power and they really put an emphasis on handling and the ergonomics of the craft itself. The Sea-Doo X-TEAM is comprised of watersports enthusiasts who take their Sea-Doo activities beyond the norm. They are the true water breathers. Those who take their recreational time on the water and turn it into more; it could be a championship, a world record, an extreme adventure, inventor of new tricks and/or redefining style. Regardless of what it is it involves pushing the limits and their vehicle of choice to take them on this journey is Sea-Doo watercraft. This Tuesday we talk to long time PWC racer Troy Snyder a self made, successful businessman with a competitive drive that bounces off the rev limiter. Snyder has been involved with the sport of PWC racing at the elite level since 1995 and has experienced a fair amount of success along with the heart breaks that come with the sport of racing. Regardless of what life paths he walked, the sport of PWC racing was in his blood, BRP yellow blood at that and today he continues his quest for racing glory. Lets get to know Troy a bit better and see what keeps his engine running. Troy, where did you grow up and how was your competitive spirit developed? I grew up in Bradenton, Florida, born and raised. I grew up playing football but raced motocross on Honda 250r ATV (there was no CAN-AM then! ), and actually won the Atlanta supercross back in maybe 1986…but I loved football. I was the starting strong safety on the 1989 Florida state 5A high school football championship team, the MANATEE HURRICANES. We finished #2 in the USA Today national poll that year! I went on to earn a scholarship to play at a small school in Kansas. So I guess you could say I became accustomed to winning. Troy what do you do away from the water to stay on the water? What’s your profession? I’m state certified residential contractor; state certified master plumber, and journeyman electrician. I build between 20-30 $150,000 house from the ground up. I don’t just ride around and let a telephone build my houses, I BUILD THEM! From clearing the land to turning the key to the front door, we do it from A-Z. Thus the name of my company is SNYDER BUILT! We remained strong during the housing downturn as we never stepped over our boundaries during the boom, we build close to the same number of houses today as we did five years ago. Being smart, consistent and steady wins the race! How were you introduced to watersports?After college I had a good friend invite me to the beach to ride this Sea-Doo thing! I was like, “what is it?” He told me I’d love it! It was a 1994 Sea-Doo SP I think with a 580cc engine! What a blast. The next weekend I bought one! Of course, the next model up so I could beat him! My first Sea-Doo watercraft was a 1994 SPX with a 650cc engine, big stuff then. A few weeks later I see a guy show up at Bayside Beach with numbers on PWC and that’s when I found out they raced PWCs. With my motocross background, and the Sea-Doo being somewhat similar to a ATV – it had handlebars – I said, “I can win where do I go!” That’s is how the bug bit me. Tell the Sea-Doo fans about your first competition, how did it go?My first race was at Orlando, Florida. My buddies came with me and said, “Man, you have to race beginners!” I said, “No way put me in expert. Well I didn’t I raced novice and WON!!! They said I was crazy! My best story is actually my first National Tour race! I raced expert 1200 mod on my Sea-Doo XP 800 in Virginia Beach, VA in 1995. In the mid-‘90s PWC racing was huge, factory semi’s, ESPN coverage; this was one of the original X-Sports. I drove there with my 16 yr old brother with my XP 800 in the back of my truck with no beach cart, tent, ATV, nothing! We pulled into the pits and my brother asked me, “Troy you sure you can race with these guys?” The Factory race team set-up in the pits was awesome but intimidating at the same time. I took a me against the world attitude – which I still hold today, probably a little too much at times. I thought, these guys can’t beat me! On the (starting) line there was about a dozen factory Yamaha WaveRaiders with me on my Sea-Doo! Fifteen laps later in the big surf I was the winner! Bruce Brahms, the Sea-Doo race manager then, ran over and asked who I was? He screamed, “You the first guy to win a 1200cc national race on the XP 800 expert or pro!” “Really?” Soon afterwards I teamed with world-class tuner Bo Dupriest and Neptune Racing and have been with him one way or another ever since. Troy since then what are some of your accolades? 1995 Finished #13 Overall on the National Tour with one victory! Only raced two rounds! 2010 WORLD CHAMPION expert limited. 2011???? Tell you in a few months! My favorite race site is everywhere I WIN!!! But Lake Havasu in Arizona where the IJSBA World Finals (World Championships) are held every October is the coolest place to win! A lot of tradition there! I love Racing! Going into the first turn side-by-side with 11 other guys at 70 mph is my reason for racing! I love it! I came out of retirement to teach my 8-year-old son, Tory how to win! Best way to teach is to show him! He’s my biggest fan and this is a great family sport to be involved in! Troy, where is your favorite non-racing, riding location? My favorite ride spot is “Bay Side” right by the Long Boat Key, Florida bridge! You can be in the Gulf of Mexico in seconds and there is a great four to five feet break right offshore! I am competing in the Pro Stock class on a Neptune Racing prepared 2011 Sea-Doo RXT-X with additional support from Snyder Built, Slippery When Wet/Thor, Bomber Eyewear, JetTrim Neptune Racing and of course with the added support from the Sea-Doo X-TEAM Bounty racer contingency program. I’m looking forward 2011 World Finals! I have unfinished business with the Pro Stock class there! I also can’t wait till I get my hands on a new Sea-Doo RXP-X 2012. My son and I shot a video with the RXP-X focused on the new ERGOlock system before it was public that should be coming out before the World Finals. That was fun and should be pretty good because the new RXP-X is AWESOME! With Neptune Racing power this Sea-Doo watercraft might go undefeated next year! !